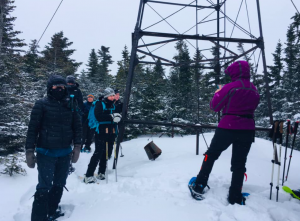 Number Four Mountain with the Bangor Outdoor Club – Go Play Outside! 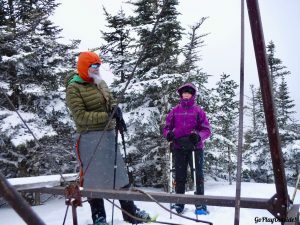 On Saturday, February 2nd, Frosty and I headed up to the Indian Hill Trading Post in Greenville to meet up with the others from the Bangor Outdoor Club who were hiking to Number Four Mountain. 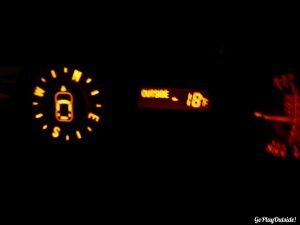 The temperature gauge on our vehicle had said -18, in places as we drove! Ugh! The predicted temperature was cold, but not that cold! Luckily it warmed up to -5, as we got to the Frenchtown Road. Of course, that temperature was without the windchill! And that wind was blowing! I don’t know the “real feel” temperature. 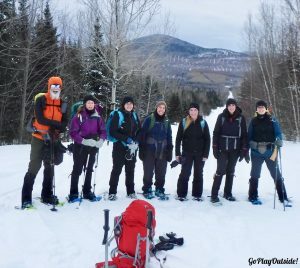 On today’s adventure, were Brett (this was to be our 3rd trip with him), Sophie, Christine, Jana, Kattie, Marie, Frosty and I. Bangor Outdoor Club can be found on Meetup and Facebook. Although Bangor is in the title, you don’t have to be from Bangor. 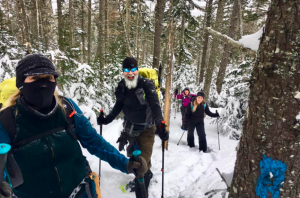 No one on this hike was from Bangor. 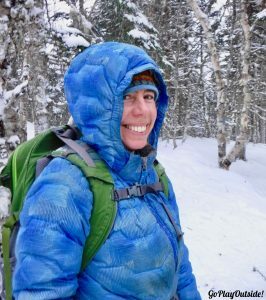 Hikers came from Castine to Bingham, and all in between. We consolidated the group into four vehicles and headed to the Frenchtown Road. 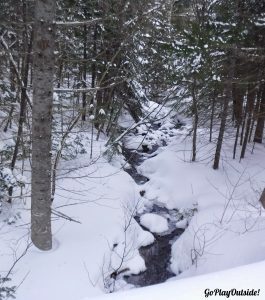 We had planned to park on the Frenchtown Road where it meets up with the Lagoon Brook Road (which is unplowed) and snowshoe into the Number Four Trailhead. Well, the best laid plans of mice and men often go awry. As we were driving in, Brett noticed a sign forbidding road side parking in the winter. This was a problem. There was a little parking spot big enough for two vehicles, but it was already full and a good bit away from the Lagoon Brook Road. Luckily, we met a very helpful young man who was out walking on the road. He let us park one vehicle on the driveway to the his family’s camp. 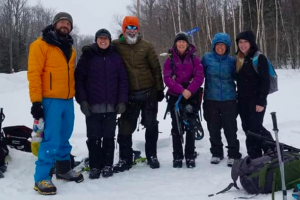 We dropped off gear and extra people at the Lagoon Brook Road. Then the drivers went back to the beginning of the Frenchtown Road where there is room to park. They left three of the vehicles there, piled into the fourth vehicle, and parked at the camp. Finally, we were ready to start. 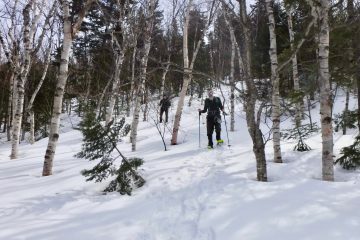 We headed out snowshoeing along the snowmobile trail on the Lagoon Brook Road. 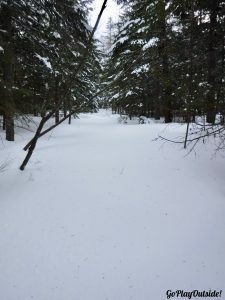 The snowmobiles had packed the snow down, so it was easy walking. It was still a long way though! We left the Lagoon Brook Road and turned onto the Meadow Brook Road. 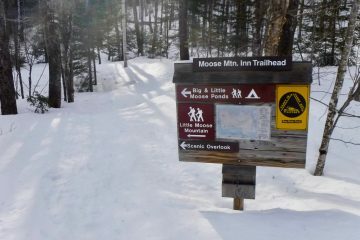 We walked on the Meadow Brook Road until we came to the trailhead. That was the end of the easy walking! The trail not only wasn’t broken, the snow was deep! 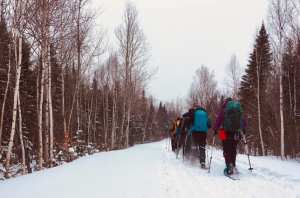 The trail starts out flat. Breaking trail through the deep snow was work and slow going. The trail gradually starts heading up Number Four. We lost the trail a few times. 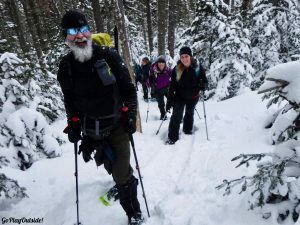 Finding unbroken trail in the winter can be a challenge at times. Some trails aren’t blazed frequently. In the summer the trodden path is much more visual than when covered with snow. We were still heading up, so that was good. We ended up on the old fire warden’s trail. The trail crosses back and forth over the old fire warden’s trail with switchbacks. The old fire warden’s (OFWT) is steep and a bit more open. 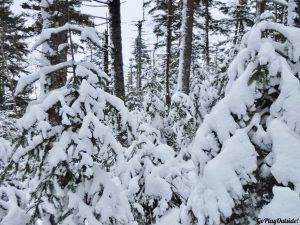 The OFWT was covered with snow drifts. We stopped for a snack break part way up. We definitely needed to fuel and hydrate. As we continued traveling up the OFWT, it was hard going. 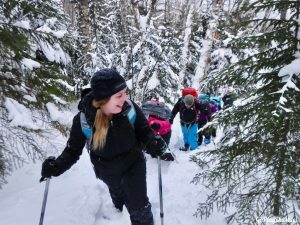 The steep terrain and deep drifts were tough. 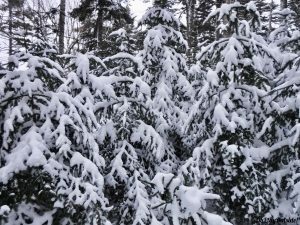 When Frosty or Brett broke trail on some steps, they were sinking down in the snow to their waists. When I broke trail on this section, I was sinking to my knees or just above. 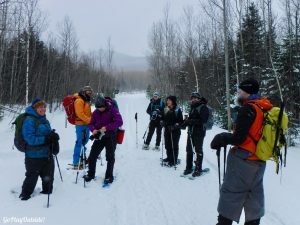 It was great to have a big group for breaking trail. It would have been so much work, possibly impossible, if we only had 2 people. Most of us took turns being first, the hardest position. Christine, though, was a beast. She was in the lead in this tough section much longer than anyone else. Wow! This wasn’t easy. The drifts were big and you would sink down a lot, but adding to this was the fact that the snow just seemed to keep slipping down as you planted your feet. It felt like an evil escalator in places: you kept stepping, but didn’t seem to be going up. Even the 4th and 5th person back were still sinking. This wasn’t easy going. After awhile we did the sensible thing, and left the OFWT and used the switchbacks where the snow was less drifted. 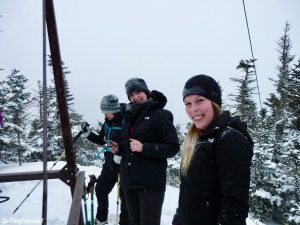 We stopped a little ways down from the summit in a wind packed area. We layered up. We had more snacks and drinks. We left our packs here and pushed up to the summit. 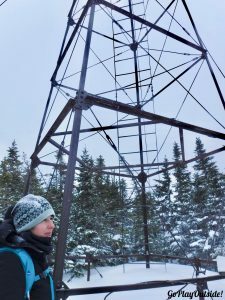 At the summit, the remnants of the old fire tower stand, no cabin – just the metal base. It had started snowing when we were part way up the mountain. The snow was just light flurries, but it obscured the view at the top. Their is a good viewpoint past the summit, but there wouldn’t be a view today, so it definitely wasn’t worth breaking trail to go to the viewpoint. 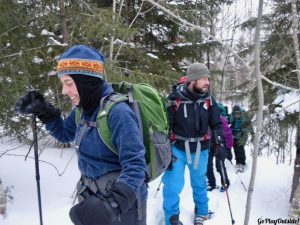 After a short time at the summit, we headed back down to get our packs. Then we headed back down, retracing our steps. On the descent, I was still sinking a bit. 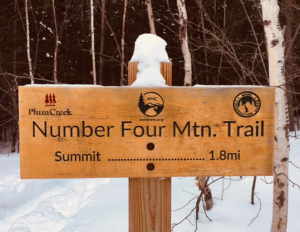 Boy, I hope any other people wanting to do a winter hike of Number Four try on the Sunday after us. They will have a nice trail! I fell twice on the way down. With all the snow, it was a very cushioned fall! 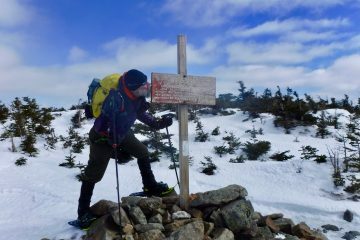 In a few places, my snowshoes decided to be skis, and I took some sliding steps. Once we all got out to the road, it felt a bit anti-climatic. The fun adventure part was over, but we still had over 2 miles left of walking. Once, we turned onto the Lagoon Brook Road, it really felt like a slog. I was tired, and just wanted to be done. I was over this road walk. We met our only snowmobiles just as we were finishing. The driver’s all piled into Kattie’s SUV to pick up the other vehicles. The non-drivers braced against the cold and waited. Once you stop moving, you get chilled easily. Half of the group had to take off for other commitments, but Christine, Jana, Frosty, and I decided to grab some food. 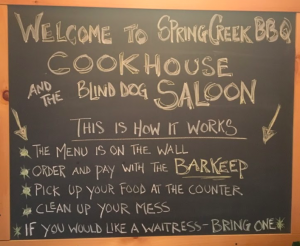 Christine recommended Spring Creek Bar-B-Q in Monson. We met up there. The food was great. So glad Christine introduced us to this place. We will certainly be back. We sampled some hot from the oven chocolate chip zucchini bread that the owners brought over. After cooking our food, the owners came out and chatted. They were very friendly. 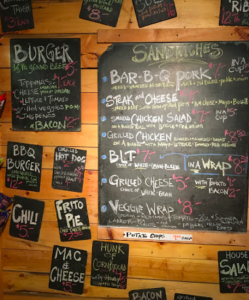 I wish I had taken some photos of our food. I was so hungry though that all I thought about was diving in! My bacon cheeseburger was awesome! Frosty enjoyed his pulled pork sandwich. While talking, we found out that Jana lived in the same town as Frosty and I! Even more surprising, I found out that Jana and I are third cousins! It was a great day! 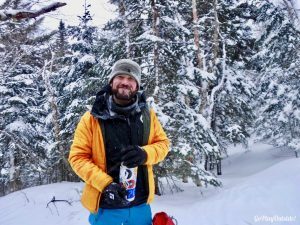 We bagged one of the winter Moosehead Pinnacle Pursuit peaks, made some new friends, and had some awesome food. Who could ask for anything more? 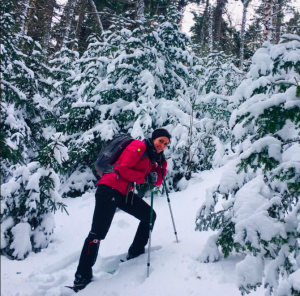 We snowshoed over 8 miles today.